White Oak’s Organic Calf Feed is designed to meet the needs of growing dairy calves. Containing 19% crude protein for optimum frame growth and overall calf development, this feed provides bio-available trace minerals from Sea-90® sea salt as well as additional vitamins and macro minerals required by developing calves. Bear River Zeolite (BRZ) is added to help improve gut health and reduce incidence of scours. This feed, formulated with organic grains and all-natural ingredients, is available in textured form and uses organic molasses to ensure high palatability and acceptance. White Oak Mills’ Organic Dry Cow Pellet is designed to meet the nutritional needs of the dry dairy cow. Intended to be fed with on-farm forages as a source of energy, protein, vitamins and minerals, this pelleted feed provides trace minerals in a bio-available form from Sea-90® sea salt with additional vitamins and macro-minerals added according to the requirements of the dry cow. Bear River Zeolite (BRZ) is included to enhance gut health. White Oak’s Organic Spike Pack is designed to be fed along with Sea-90® sea salt. This product provides additional macro-minerals, vitamins, and selenium and can be incorporated into lactating, dry or calf/heifer rations. 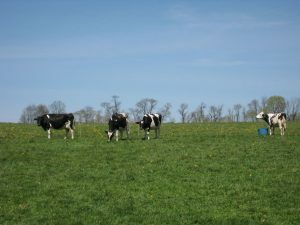 Please consult with a White Oak Dairy Specialist for feeding rates based on available forages. Bovamine® Dairy Organic is available in 500 dose packs. Live, viable, naturally-occurring micro-organisms, this product stimulates natural, healthy digestion of vital nutrients necessary for dairy cattle and helps to stabilize the rumen and lower GI tract. The feeding rate is 1 oz per head per day. Bovamine is a registered trademark of Chr Hansen.